For me, the most striking part of French sculptor Auguste Rodin’s representations of the human figure are the hands. 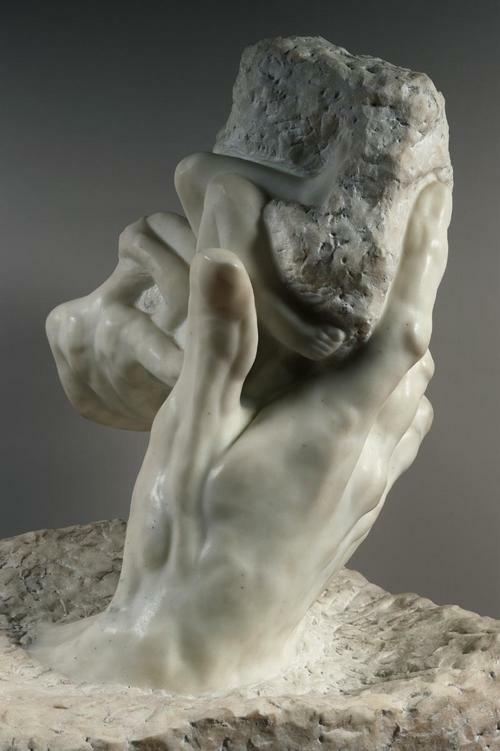 Rodin was obsessed with the emotive power of the hands in his work, using them as metaphors for creation, and to convey an infinite variety of emotions--including anguish, fury, and compassion. I fashion these pieces around three of Rodin’s hand sculptures--The Hand of the Devil, Clenched Hand, and The Hand of God. Movement one, the Hand of the Devil, reflects the sculpture. Attempting to escape, a female form emerges from a thin, muscularly undefined hand. The woman is in the fetal position, clutching herself, as if to keep warm. The hand lays lifeless on the ground, offering no support for the figure. Clenched Hand is a fiercely animated movement, with abrasive textures and angular rhythms. The contorted hand captures the intense anguish the attached person must be enduring. The Hand of God complements its diametrical opposite, the first movement. From the unrefined rock, male and female forms emerge, entangled, lifted up into the air. Written in 2007 at the Curtis Institute of Music and revised for the second performance at the Atlantic Music Festival in 2015, the movements continue without a pause and last approximately 20 minutes.